Orange Oil Tar and Asphalt Remover Contains No Chlorinated Solvents. Biodegradable. Big Orange is a heavy-duty, non-petroleum cleaning/degreasing aerosol. It contains no caustics, acids, petroleum distillates or chlorinated aromatic solvents. Nor does it contain any fluorocarbon propellants to contribute to ozone layer depletion. 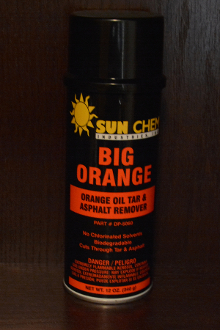 Completely biodegradable and ecologically desirable, Sun Chem Big Orange aerosol contains 100% natural citrus solvent, and may be used to clean and degrease molds, dies, unpainted concrete floors, and industrial equipment. Big Orange is also available in liquid form.